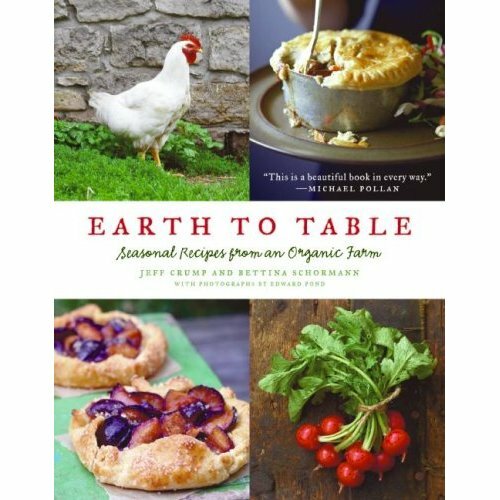 So that explains how I happened across a new book by Jeff Crump and Bettina Schormann called Earth to Table: Seasonal Recipes from an Organic Farm. Crump and Schormann, according to the jacket flap, are chefs and members of the slow food movement, which is an international effort to preserve regional and traditional cuisine. Slow “foodies” also support local farming and livestock practices. There’s a political element to their movement, in that members want to raise awareness about the dangers of depending on too few genomes and varieties in our food supply, and that’s one reason it interests me. I’m convinced that we need to save our heirloom food and flower varieties, and not let them disappear because big corporations control what kinds of seeds and plants we can buy. Slow foodies also encourage organic gardening, as opposed to the use of potentially dangerous pesticides, and remind us that the opposite of “slow food,” which is fast food, isn’t a particularly good nutritional choice for most of us. But back to the book. Turns out it’s as beautiful on the inside as the outside. The book is packed with how-to tips on such things as creating a compost pile, canning and preserving, and planting an herb garden. Each chapter also contains seasonal recipes, so you can best use whatever is growing in your garden at any given time of year. I won’t use everything I read about in this book; I can’t see myself gathering and preparing a dish of stinging nettles for my family, for example, and no matter how luscious some wild mushrooms may appear, I’m not going harvest my own for the table. I’ve read too many warnings about how poisonous ‘shrooms can mimic the kind that are safe to eat. But there’s plenty more that I can use, like a recipe for a refreshing watermelon drink sweetened with honey and tarted up with lime. I’m already planning to make a Chez Panisse recipe from the book that makes corn soup with fresh corn, garlic, white wine vinegar, chicken stock, and freshly cracked black pepper. Sounds delicious served with cayenne pepper sprinkled on top. There’s a recipe for a beet salad made with heirloom beets, feta, and pumpkin seeds, and one for roasted autumn fruits. I also enjoyed reading the profiles of heirloom cooks, dairymen and women, and farmers. Makes me determined to eat more local and seasonal foods, not only to benefit the economy in my area, but also to improve the quality and taste of the meals I serve my family!